Obrigado is a jazz group that ranges from a duo to larger ensembles based on the needs, desires and budget of the client. Founded by consumate professional musicians, Welson Tremura and Jim Sain, Obrigado brings more than 75 years of musical experiece to the fore. Brazilian born guitarist, percussionist and vocalist, Welson Tremua, holds the doctorate in ethnomusicology and bassist/composer Jim Sain holds a doctorate in music composition. 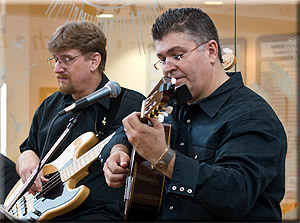 Both have been playing jazz since an early age and enjoy sharing their love for the classic, contemporary and Latin jazz stylings to wide variety of audiences in concert, dinner and private party settings. "Obrigado" means "thank you" in Portuguese and we'd like to thank you for your time and interest. I hope you'll contact us about your future musical needs. Copyright (c) 2011 obrigadojazz.com. All rights reserved.